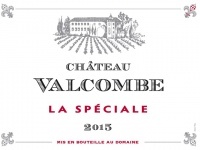 he Château Valcombe Special Reserve 2015 is a red, well structured wine, fresh and vibrant. It is produced from very old Carignan vines; these plots are tended with great respect. It is an atypical wine in our range due to the age of the vines and its maturing in oak barrels. This unique wine will be enjoyed by all those who already know our other Valcombe vintages. Thanks to its freshness and vibrancy it will pep up dishes cooked with sauce or cream as well as poultry (capon, turkey with chestnuts). It will also be a good match with soft cheeses, reblochon, roquefort and blue cheeses. Will age well over ten years. Situated in the town of St Pierre de Vassols, at an altitude of 250 metres, on hillsides oriented north-west, facing the Dentelles de Montmirail. The soil is vegetal, humid, clay and sand based, grey-brown with a yellowish hue, pebbly and gravelly. The silt lies on dark ocher fine sand. Some areas sit on oxidised gravels. Our vines are manually disbudded, deleafed and destemmed. Our grapes are then hand-picked, enabling us to select the best bunches. Nose: Oak overtones, roasted aromas and notes of vanilla. Slightly lactic then displaying more spicy notes, balsamic and mineral. Palate: Taut on the palate, marked acidity, great structure. Prevailing oak flavours with undertones of white coffee and caramel.